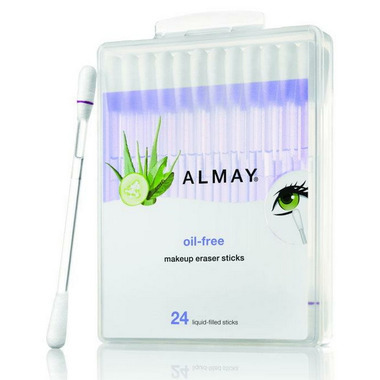 Almay Oil-Free Eye Makeup Eraser Sticks are perfect for effortlessly erasing mistakes during application without disturbing the rest of your makeup. These easy to use soft cotton tip swabs are individually filled with Almay oil free eye makeup remover formula. This product is absolutely phenomenal and far superior to anything else on the market. It fulfills its purpose of correcting mishaps or errors for makeup. Especially for mascara, brow, lip n eyeliner, and even eyeshadow! It's the easiest, quickest and most accurate eraser/fixer -- clearly makes it the most reliable choice. I cant live without this product. I travel to my grandsons and take these with me. I gave it a 4 only because it gets expensive if you use it ever day. These are convenient, not messy, easy to pack. They dont dry out as some others do. This is a fantastic product and I always have a backup supply. I use it mainly to remove mascara splotches from my eyelids(can't seem to avoid those!) but this is good to erase any small makeup mistake. Super simple to use, and very portable. A must-have! This product is great for touch ups during the summer humidity or after a gym workout. I keep one in my purse and gym bag all the time! I wish people would read the item description before writing that there's not enough in each q-tip to remove makeup. This is NOT A MAKEUP REMOVER! It is an eraser for makeup mistakes! It is fantastic & I will be ordering this again!! Easily removes mistakes without affecting the rest of my makeup. Love it!! Awesome product. Convenient for travel and easy to use. I agree with another review that not enough of the liquid goes into the swabs. I won't be buying this again. Wonderful concept!!! Works well for waterproof mascara... Would HIGHLY recommend this product!!! Not impressed at all. Not enough make up remover goes into the cotton swab, so you end up rubbing to get liner and mascara off, damages the skin. Remover is good for sensitive eyes....if you can get enough. Better then I expected., and worked well for my sensitive eyes. I'd buy them again. Worth the price. I love it so much!!!! Is so convenient and easy to use. I will keep buying this in the future!! I will be purchasing more of these! I like how they are easy to use and to apply. They are great for small spaces too! The plastic container is reusable for regular cotton tips! They are gentle on my sensitive skin, plus they're great to keep in the purse for times you can't get to a sink but want to remove your eye makeup. Recommend this product to makeup wearers.